The ApselLab group is a research group led by Prof. Alyssa Apsel with interests broadly within the field of high performance analog and mixed signal integrated circuits and systems. Since our inception, our research has been guided by a unifying core value: Scaling of integrated circuit technology, while solving many problems, creates many other interesting problems and new research challenges at the system level and the circuit level. To address some of the system level challenges, we have explored a variety of issues related to high speed/high bandwidth optical interconnect as an alternative to electrical interconnect at the board and chip level. At the circuit and systems level, we have also examined issues of power minimization in a variety of communication and sensing circuits and systems. At the circuit-level, we have begun a promising investigation into design techniques to reduce the impact of process variation in analog and mixed signal circuits. 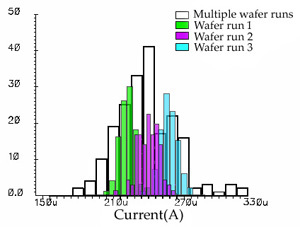 Transistor output current may vary across multiple wafer runs, which is a vivid example of process variation. Read more.